Home » Academics » Schools » School of Science, Engineering and Technology » Faculty » Gary B. Ogden, Ph.D.
Gary B. Ogden, Ph.D., Professor of Biological Sciences at St. Mary’s University, is very appreciative of being able to share his enthusiasm for genetics, cell biology and microbiology with his students. Ogden first developed a love for teaching in graduate school. After earning his Ph.D., he held postdoctoral positions at Tufts School of Medicine and the National Institutes of Health, and both institutions provided him with opportunities to teach graduate and professional students. After his tenure at the NIH, he obtained a research faculty position at Yale University’s School of Medicine. However, his long-term goal was to teach undergraduates, and he left Yale in 1991 to join the Biology Department at St. Mary’s. Ogden believes his wide-ranging research experience has enabled him to be a better teacher. He has used the methods of molecular genetics, biochemistry and cell biology throughout his career. Ogden has studied chromatin in the DNA tumor virus SV40 and DNA replication in Escherichia coli, respectively, and has performed primary research concerning vaccine development and the virulence mechanisms of several important microbial pathogens. At Tufts, Ogden made the seminal observation that epigenetic changes (i.e., methylation of GATC sequences) in E. coli’s origin of replication may regulate the ability of the cell to initiate new rounds of DNA replication. While at St. Mary’s, Ogden obtained research grants with a colleague at the University of Texas Health Science Center at San Antonio (UTHSCSA), and they proved the efficacy of a novel genetic approach to vaccine development, using as a model the organism Leishmania donovani, an important agent of tropical disease. In 2005, while on a sabbatical at Harvard Medical School, Ogden conducted proprietary research to introduce directed gene knockouts into mycobacteria to aid in better understanding and combating tuberculosis. 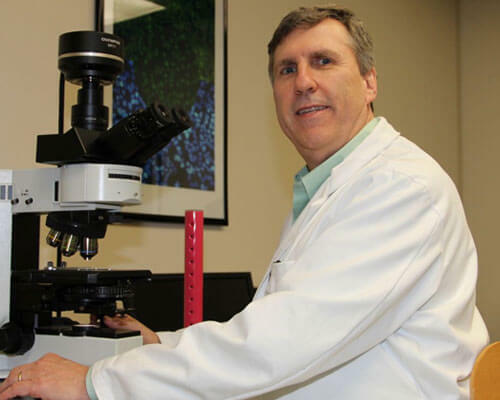 He has also collaborated with colleagues at St. Mary’s and the UTHSCSA on research concerning the stimulation of apoptosis in a breast cancer cell line and other projects. Most of these studies have enabled St. Mary’s Biology majors to participate actively in laboratory research. In 1996 and 1997, Ogden received fellowships from the Brazilian National Science Council to co-direct and teach a laboratory research-based molecular biology course at the Butantan Institute in Sao Paulo, Brazil. The success of this endeavor led to Ogden’s obtaining a grant from the National Science Foundation in 1998 to introduce more St. Mary’s students to bench research, by incorporating authentic research experiences into undergraduate laboratory courses. Ogden was appointed to the Local Organizing Committee for the 44th Annual Meeting of The American Society of Tropical Medicine and Hygiene in 1995. From 1999 to 2004, he was the program director for the NIH-Support for Continuous Research Excellence Program at St. Mary’s University—for the first time, providing facilities and funding for faculty research on campus. In 2009, Ogden received the Distinguished Faculty Award for Teaching Excellence from St. Mary’s University, and the St. Mary’s University Alumni Association recognized Ogden with the Gateway Million+ Club Award in 2015. Ogden, G. B. and P. C. Melby, “Leishmania.” In: M. Schaechter (ed. ), Eukaryotic Microbes. (First Ed. ), Acad. Press, San Diego, pp 335, 2012. Ogden, G. B. and P. C. Melby, “Leishmaniasis.” In: M. Schaechter (ed. ), Encyclopedia of Microbiology. (Third Ed. ), Vol 3, Acad. Press, San Diego, pp 663, 2009. Korkmaz A., H. Tamura, L.C. Manchester, G.B. Ogden, D.X. Tan, R.J. Reiter. 2009. Combination of melatonin and a peroxisome proliferator-activated receptor-gamma agonist induces apoptosis in a breast cancer cell line. J. Pineal Res. 2009, 46(1), p. 115. Melby, P.C., G.B. Ogden, J. Yang, L.E. Perez, W. Zhao, W. Park, L. Elizondo. “Histone antigens are targets of the immune response in experimental visceral leishmaniasis.” Am. J. Trop. Med. Hyg. 2001, 65:447 (Abstract). Melby, P.C., G.B. Ogden, H.A. Flores, W. Zhao, C. Geldmacher, N.M. Biediger, S.K. Ahuja, J. Uranga and M. Melendez. 2000. Identification of vaccine candidates for experimental visceral leishmaniasis by immunization with sequential fractions of a cDNA expression library. Infection and Immunity 68, p. 5595. Ogden, G.B., “The isolation and characterization of chicken IgY is an effective tool for teaching undergraduate immunology laboratories.” ASM Regional Microbiology Education Conference, the University of Arkansas for Medical Sciences, Little Rock, AR, November 10-11, 2000 (Abstract and Invited Workshop Presenter). Ogden, G.B., T. Uranga, J. Cheng, B. Chandrasekar, L. Perez, and P.C. Melby, “Molecular cloning and sequencing of a cDNA for a gene highly conserved Leishmania.” 1999, ASM Conference on a Cell Biology Approach to Microbial Pathogenesis, Portland, OR, April 25-28, 1999 (Abstract). Ogden, G.B., “Effective protozoal models for enhancing undergraduate student’s interest and training in cell and molecular biology.” Gordon research Conference on Teaching Undergraduate Microbiology, New London, CT, June 26-July 1, 1999. Manchester, L.C., B. Poeggeler, F.L. Alvares, G.B. Ogden, and R.J. Reiter. 1996. Melatonin immunoreactivity in the photosynthetic prokaryote Rhodospirillum rubrum: Implications for an ancient antioxidant system, Cell. and Molec. Biol. Res. 41, p. 391. Uranga, A., P.C. Melby, and G.B. Ogden. “Comparative analysis of Leishmania mexicana promastigote and amastigote cDNA by differential gene display.” 1996 NIGMS-Minority Programs Research Symposium, Miami, FL, October 18-19, 1996. Ogden, G.B., “Using project-oriented laboratories to enhance undergraduate students’ training in immunology.” 95th Gen. Meet. Amer. Soc. Microbiol., Washington, D.C., May 21-25, 1995 (Abstract). Tambourgi, D.V., T.L. Kipnis, W. Dias da Silva, K.A. Joiner, A. Sher, S. Heath, B.F. Hall and G.B. Ogden. 1993. A partial cDNA clone of trypomastigote decay-accelerating factor (T-DAF), a developmentally regulated complement inhibitor of Trypanosoma cruzi, has genetic and functional similarities to the human complement inhibitor DAF, Infection and Immunity. 61, p. 3656. Tambourgi, D.V., G.B. Ogden, B.F. Hall, W. Dias da Silva and T.L. Kipnis. 1993. Biotinylation a fast and reproducible method for labeling Trypanosoma cruzi cell surface proteins, Trop. Med. Parasitol. 44, p. 91. Tambourgi, D.V., T.L. Kipnis, K.A. Joiner, A. Sher, W. Dias da Silva, C.M. Dias de Abreu, B. F. Hall and G.B. Ogden. 1991. T-DAF: A developmentally regulated complement inhibitor expressed by trypomastigotes of T. cruzi, Mem. Inst. Oswaldo Cruz. 86, p. 81. Ogden, G.B., M.J. Pratt and M. Schaechter. 1988. The replicative origin of the E. coli chromosome binds to cell membranes only when hemimethylated. Cell. 54, p. 127.